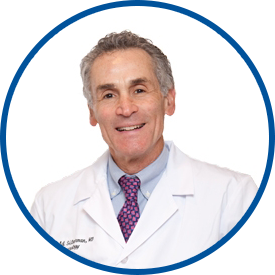 Dr. Silverman is an attending physician at Lawrence Hospital and at New York-Presbyterian Hospital, and is an assistant clinical professor of neurology at the Columbia University College of Physicians and Surgeons. He is chief of neurology at Lawrence Hospital, where he is also director of the hospital’s stroke service. A graduate of Dartmouth College, Dr. Silverman received his medical degree from Albert Einstein College of Medicine and completed his neurology residency at Mount Sinai School of Medicine. Dr. Silverman was a founding partner of Neurologic Consultants of Westchester that was established in 1976. He and his associates joined Westmed Medical Group in October 2010. Doctor is an excellent, caring doctor. Dr. Silverman is a wonderful physician- a caring, knowledgeable and empathic medical professional. He was very understanding & compassionate & informative. I was very satisfied. Dr. Silverman is very caring and I trust my care with him 100 percent. *Dr. Silverman is a great doctor who cares about your issues & tries to resolve the issue.